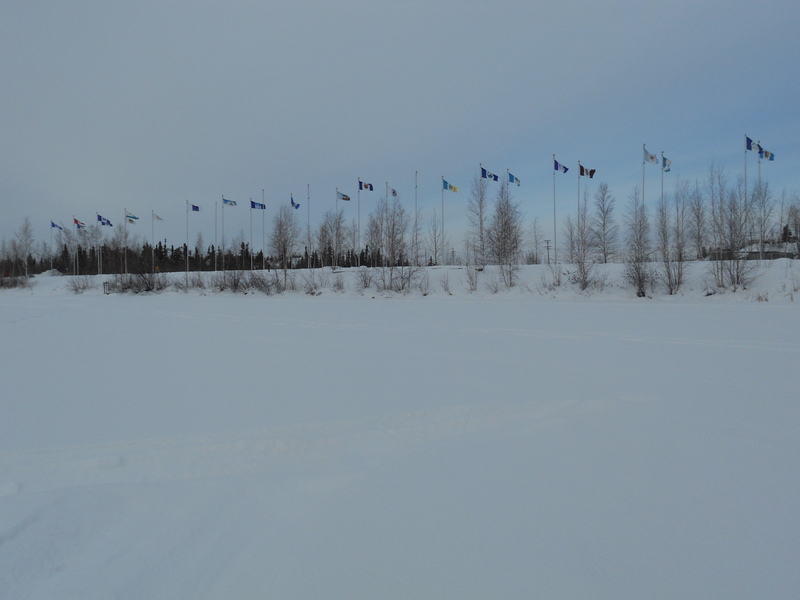 One of the attractive things about living in Yellowknife is that you never feel hemmed in. The vista is largely uncluttered and in 5 minutes you can be out in the wilderness, with nothing man-made within sight. At this time of year, the rocks stick out from under the snow and the lakes are an expanse of white. When you walk on a frozen lake, the snow covering it is so white that it takes on a tinge of blue. Air pollution is low so even in town, on the less-travelled streets, the snow remains pristine. That is both good and bad, in that usually at this point in the winter, my eyes get the ocular version of cabin fever. They tire of being assaulted by white everywhere, especially on grey days, and they yearn for some vibrant colour. But there’s no chance of that, not for a few more months. So the best thing to do is to get outside, take in the fresh air, play in the snow and seize the best that you can find in the monochromatic landscape. The quinzees that were constructed on Frame Lake for last month’s World Snow Day are still standing, and the twigs are still sticking out of them. 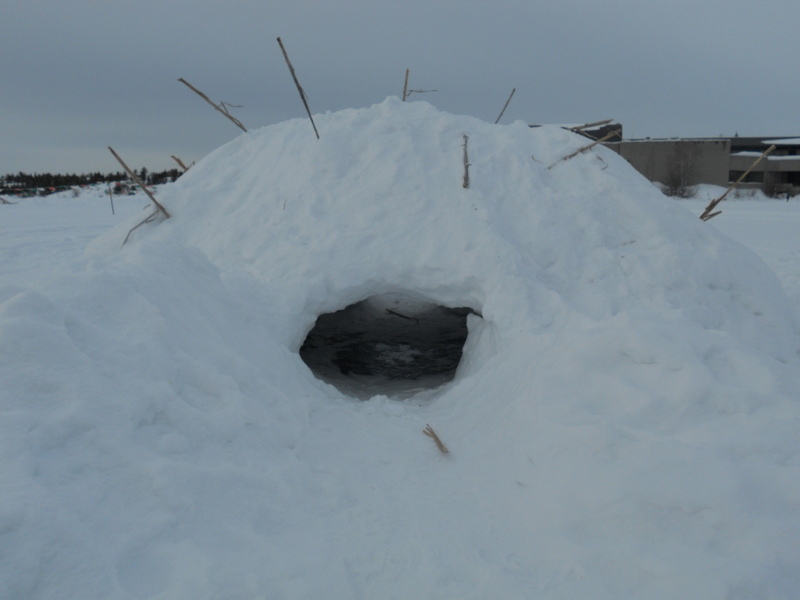 Quinzees are short-term snow houses or shelters, made from hollowing out the inside of piled-up snow. The snow is piled up in a circular mound and left to settle for some hours or for a night, so that it bonds. Contrast that with igloos, which are made from blocks of hard-packed snow and tend to be inhabited for long periods of time. Twigs are placed all around the pile of snow to mark the depth of the walls of the quinzee, so the person digging from the inside knows to stop once the end of a twig is hit. Frankly, I wouldn’t want to be digging from inside one of those, as I wouldn’t want to run the risk of it collapsing on me. Of course, you need to be safety-conscious when building a quinzee and ensure that somebody is always on the outside, to dig the diggers out if necessary. You also need to be aware of temperature changes, because when that snow heats up, the structure will lose its stability. A stone’s throw across the lake, outside the museum, there’s more evidence of people playing with snow. 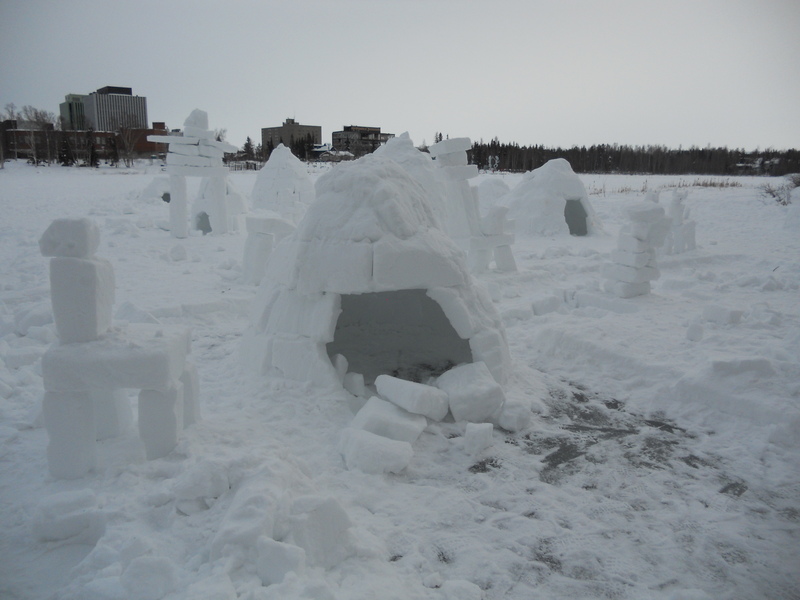 This time it’s igloos of various sizes and in various stages of completion, made by children. There’s also what looks like a snow chair, and blocks of snow simply lying around. Perhaps those assigned to make the blocks made too many, or interest in making anything with them eventually faded. 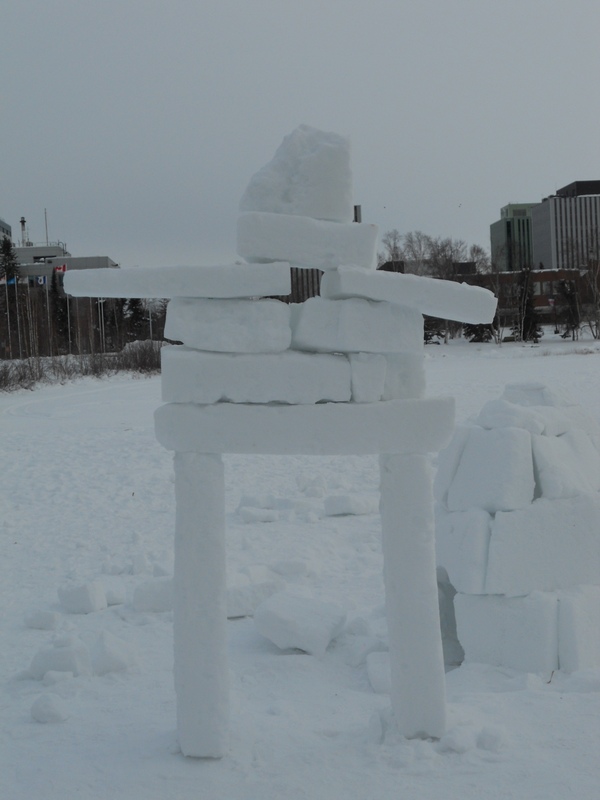 There’s one rather well-made snow inukshuk that stands out – literally – among the igloos and other structures. It’s easy to understand why people in the north feel such a strong connection to the land: because you can see it all the time – and so much of it – and you don’t even have to drive to be able to plant your feet in the peacefulness of it. When you live in a city down south, you’re barely aware of the land under your feet because much of it is encased in concrete. Add to that the fact that many northern residents still obtain food, clothing and shelter from the land, and it moves beyond a heart-felt love to a life-sustaining connection. That northern connection to the land was thrown into the spotlight 41 years ago, in 1974, when a consortium of oil companies proposed a natural gas pipeline that would run from Prudhoe Bay in Alaska, across the northern Yukon and down the Mackenzie River Valley into Alberta. It was to be the biggest private construction project in the history of Canada. Justice Thomas Berger was commissioned to examine the impact of such a pipeline, which came to be known as the Mackenzie Valley Pipeline. Justice Berger and his staff travelled around the north and listened to the views of northern residents. In those days there was very little news coverage of the north, but the Berger Inquiry was given a fair share of attention. The CBC even sent bilingual reporters who spoke aboriginal languages. The Berger Inquiry was considered a matter that concerned all Canadians. 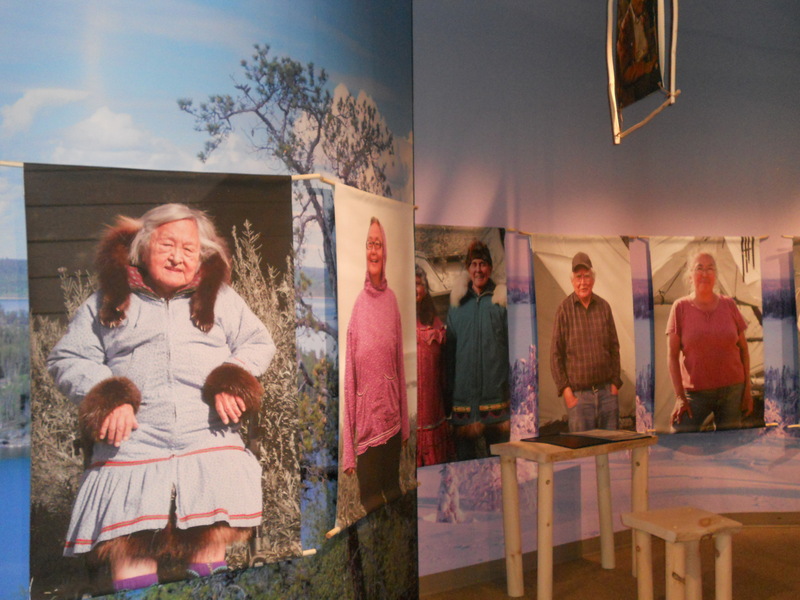 Thunder in Our Voices, a travelling exhibit that marks the 40th anniversary of The Berger Inquiry, is on at the museum. It’s both compact and interactive. 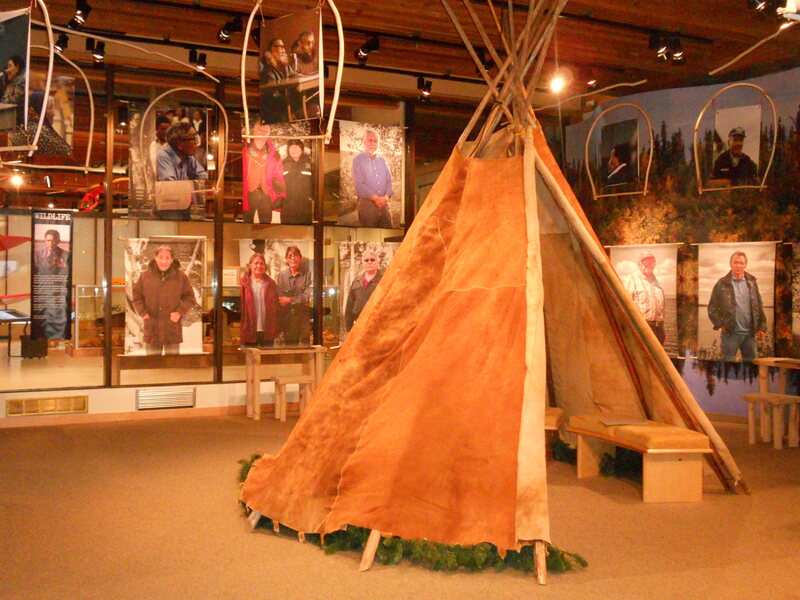 There’s a tipi made out of 9 moose hides, inside of which you can sit and watch a video of archival footage, overlaid with audio of testimony from the inquiry and added contemporary commentary. 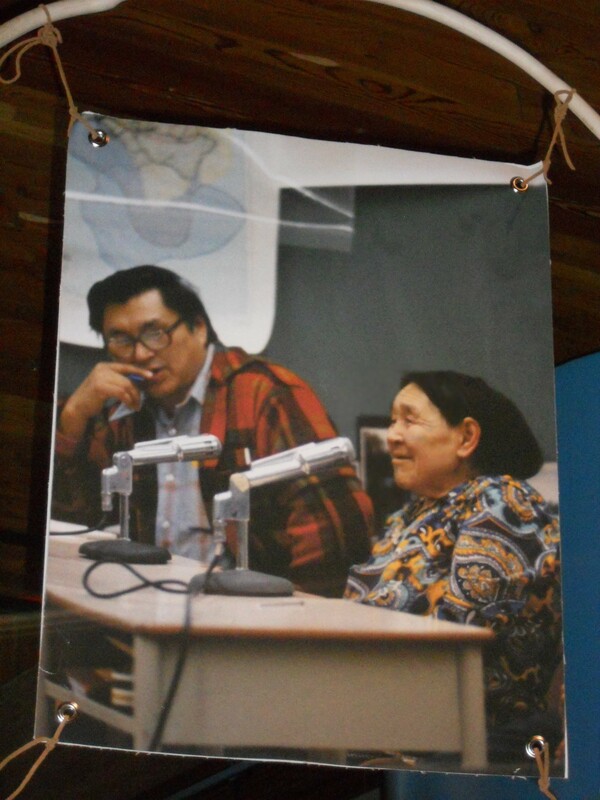 Outside the tipi, hanging on the walls of the space, there are large, current-day portraits of key people who testified at the inquiry. At 3 stations around the space, there are binders containing the reminiscences of these same people, usually with 2 photos of them: one that was taken during the days of the inquiry and a head shot of them today. It’s interesting to match the head shot with the person in the large portraits, and to see them as they were 40 years ago. As is typical in Yellowknife, you always see somebody you know. Strung from the ceiling, on beaver hide stretchers, are various pictures taken during the inquiry. Needless to say, people did not want the pipeline because of the damage that they foresaw it potentially doing to the environment. The feeling among some was that if they allowed a gas pipeline, an oil pipeline would soon follow, and an oil spill would do untold damage. Testimony was about the effects of such a pipeline on marine and land animals, all of which play a role in the circle of nature that sustains the population. The rights to the land were also in great dispute. The Thunder in Our Voices exhibit runs until April and Thomas Berger will be giving a presentation on it on March 3rd at the museum.